WILLEMSTAD - The Minister of Health, Environment and Nature Suzy Camelia-Römer says that individual companies meet the standards for air pollution, but that these companies together are exceeding the standards. This is not just about the refinery, but also for the CRU and Aqualectra, according to the Minister. The statements made by Camelia-Römer in September of air quality were, according to her, about a report from the Julianadorp area in 2016. The norm has not been exceeded in that area. Environmental Organization SMOC pointed out earlier that the measurements that were used did not take place around the refinery. 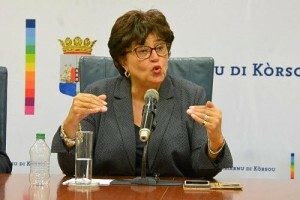 When she was appointed as Minister of Public Health, it appeared that the government would change its policies on dealing with air pollution on the island. The Minister said in mid-July that environmental pollution would really be addressed. The oil refinery Isla was warned that they can count on government’s actions in the event of air pollution, especially when the environmental standard was exceeded. This is what Camelia-Römer said at that time. The Minister now says that individual companies adhere to the norm and thus cannot be addressed. The Minister is still behind her statements about the report on the Julianadorp area.